David Fong | Miami Valley Today Isaac Burns goes up and over the bar in the high jump during the Troy High School track and field program’s spring camp for elementary school students. David Fong | Miami Valley Today A group of athletes take place in the hudle relays during the Troy High School track and field program’s spring camp for elementary school students. 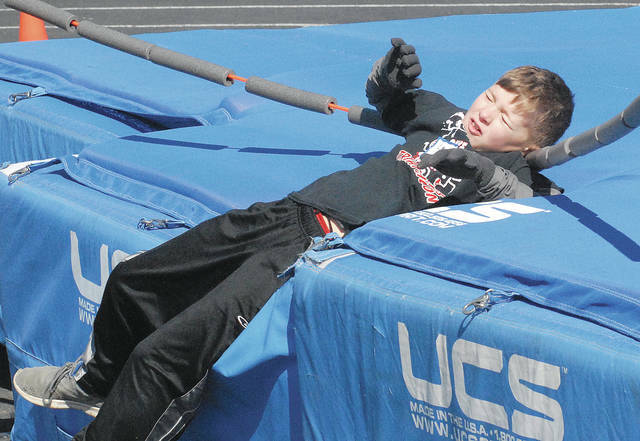 David Fong | Miami Valley Today Carson Sentman attemps to get over the bar in the high jump during the Troy High School track and field program’s spring camp for elementary school students. TROY — Even with as much success as the Troy track and field programs have had of late — the girls have won eight Greater Western Ohio Conference North Division titles in a row, while the boys have won five of the last seven — Troy girls coach Kurt Snyder always has an eye toward the future. Last week, Snyder, along with boys coach Deon Metz, helped run the Troy High School track and field camp for elementary school students while Troy was on spring break. Snyder started running the camp four years ago, and it has grown every year since. About 20 kids attended the first three-day camp, which always runs during Troy’s spring break, and the numbers have grown every year. 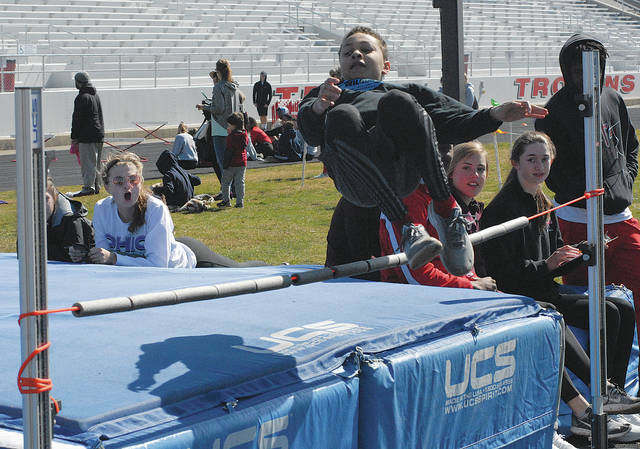 This year, roughly 50 kids spent three days learning all of the events track and field as to offer. In addition to Snyder and Metz, the camp is run by Troy’s assistant coaches and members of both the boys and girls high school teams. “The high school kids all have a lot of fun doing it,” Snyder said. While the camp does include running, Snyder said it focuses more on the specialty events young athletes might not otherwise get exposed to if they didn’t attend the camp. Snyder said he hopes the camps will encourage young athletes to consider participating in track and field when they get older — and the numbers on the Troy Junior High School team would indicate they have. Even if the young athletes don’t grow up to run for the Trojans in junior high and high school, Snyder said, at the very least they have the opportunity to get some exercise and have fun during spring break. “We want the kids to be active and have some fun with their friends,” he said. https://www.dailycall.com/wp-content/uploads/sites/30/2019/04/web1_isaac-burns.jpgDavid Fong | Miami Valley Today Isaac Burns goes up and over the bar in the high jump during the Troy High School track and field program’s spring camp for elementary school students. 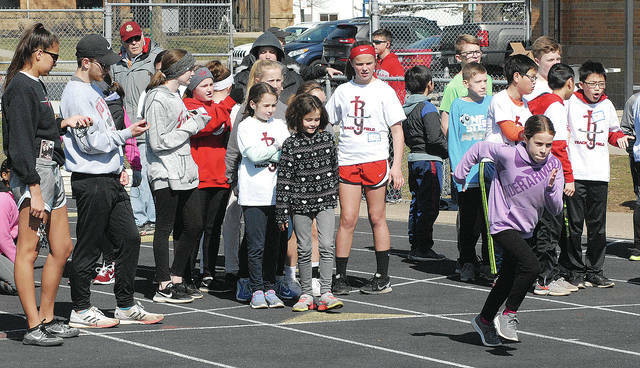 https://www.dailycall.com/wp-content/uploads/sites/30/2019/04/web1_group.jpgDavid Fong | Miami Valley Today A group of athletes take place in the hudle relays during the Troy High School track and field program’s spring camp for elementary school students. https://www.dailycall.com/wp-content/uploads/sites/30/2019/04/web1_carson-sentman.jpgDavid Fong | Miami Valley Today Carson Sentman attemps to get over the bar in the high jump during the Troy High School track and field program’s spring camp for elementary school students.